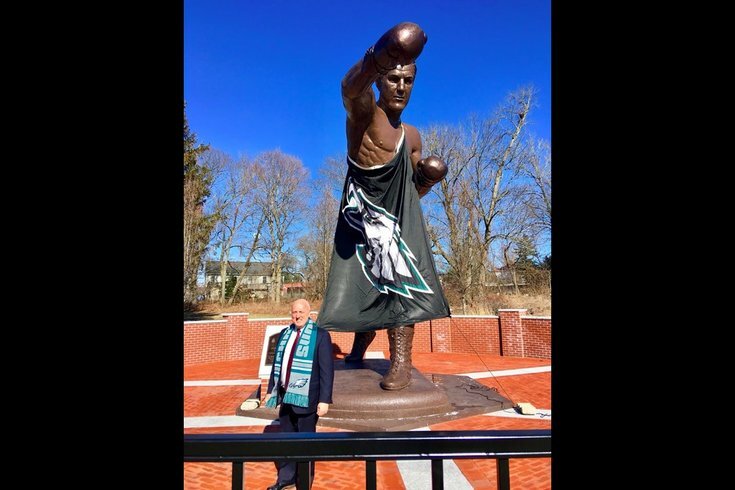 Brockton Mayor Bill Carptenter fulfills his end of a Super Bowl bet by draping the city's Rocky Marciano statue in Eagles garb. A Massachusetts city held up its end of a Super Bowl bet by adorning its statue of Rocky Marciano with a Philadelphia Eagles flag. Wearing an Eagles scarf, Brockton Mayor Bill Carpenter posed for photos on Tuesday in front of the New England city's newly-decorated statue. Carpenter lost the bet to Philadelphia Mayor Jim Kenney when the Eagles topped the Patriots, 41-33, in dramatic fashion in Super Bowl LII. Prior to the game, the two mayors had agreed that the loser would have to decorate their city's respective Rocky statue in the opposing teams' gear. "A bet's a bet," Carpenter wrote on Twitter after posing beside the statue. "Although painful, it's been great to bring some positive exposure to our statue, Rocky's legacy and our City." It should be noted that it took Brockton more than three weeks to carry out its end of the bet. Nevertheless, Kenney responded in kind. Kenney thanked Carpenter for his sportsmanship Wednesday on Twitter, adding "Great to meet you last month – and #FlyEaglesFly!" Of course, it should be noted that the Rocky statues do not depict the same boxers. The Rocky Marciano statue, which sits outside Brockton High School, depicts the former heavyweight champion, a Brockton native who died in 1969. Philadelphia's Rocky statue, which sits alongside the Philadelphia Museum of Art, depicts Rocky Balboa, the fictional boxer from the "Rocky" movies. The Enterprise, a newspaper in Southeastern Massachusetts, posted a video of the Rocky Marciano statue being draped in Eagles garb.